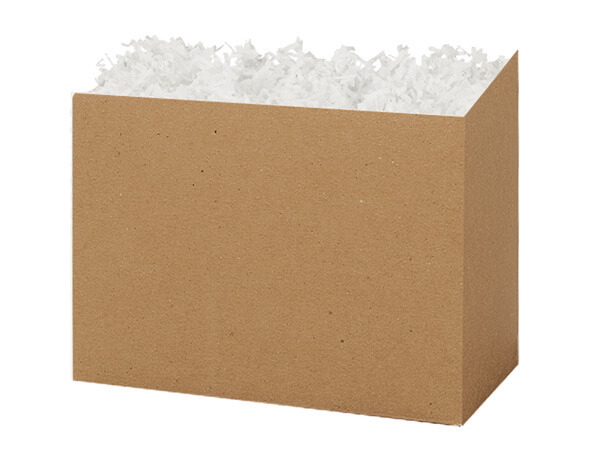 Medium Solid Kraft Basket Boxes 8-1/4x4-3/4x6-1/4"
Buy More Color Basket Boxes Save More! You get what you pay for with Nashville Wraps...other companies sell lighter weight boxes that do not pass the quality and strength standards of Nashville Wraps customers. Why use a basket? Solid Color Basket Boxes store flat and are a unique and inexpensive alternative to bulky gift baskets. Combine with our shred and basket-sized cello bags for the perfect gift basket. They also make great table centerpieces for parties. Sturdy reusable boxes. We recommend our C2030BC cello bags for Large basket boxes, C16BC for Medium basket boxes & C14BC cello bags for Small basket boxes. Solid color boxes are available in Large: 10.25 x 6 x 7.5" Medium: 8.25 x 4.75 x 6.25" and Small: 6.75 x 4 x 5".